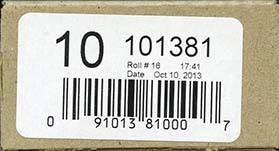 coil rolls of 50 ($1.10, $1.34 and $1.85) or 100 (P) with a 'gutter' every 10 stamps that contains an inscription. Gutters are collected in strips of 4 with 2 stamps on either side of the gutter. Single stamps are serpentine die cut (rounded tips) on the top and bottom. It is known that the coils are printed with 10 rolls across the printing sleeve. booklet 'panels' of 6 ($1.10, $1.34 and $1.85). Single stamps are serpentine die cut (rounded tips) on the top and bottom. 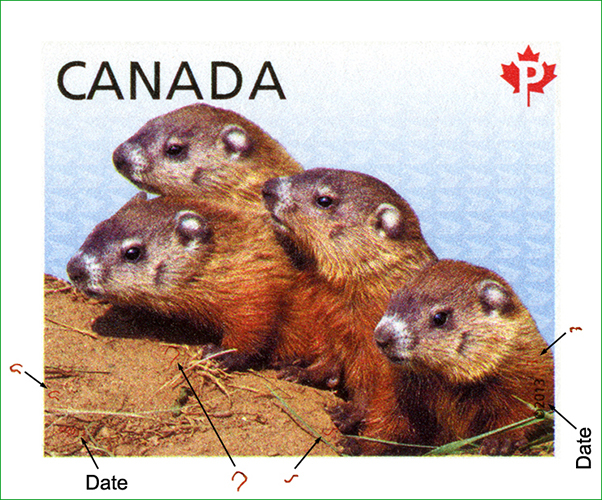 For the second time in Canadian philately, these stamps have two hidden dates on each stamp; one that is quite apparent while a second that is a bit smaller and harder to find. 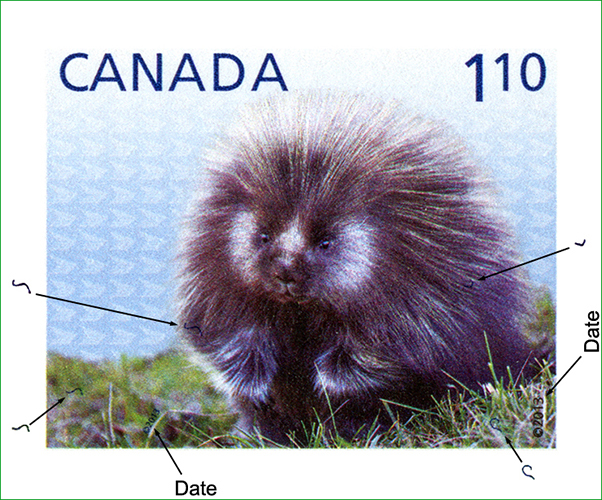 In addition, each stamp has two, three or four "squigles" hidden with the design. The squigles are in the same colour as the second hidden date. Both of the above 'features' are most likely for security purposes. 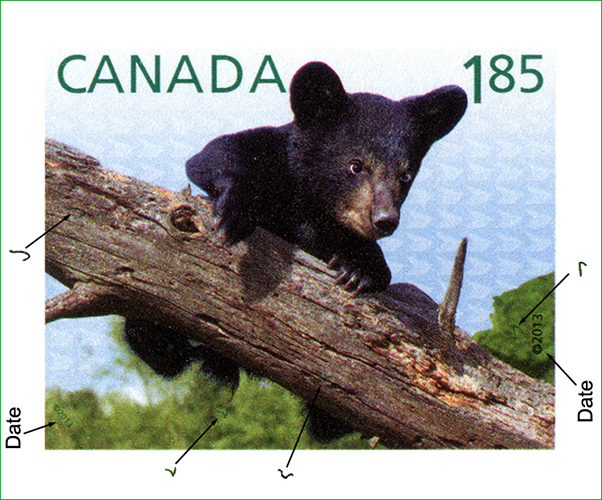 The 'hidden' tagging on all of the stamps is a simple 4-sided. There are no other "hidden" elements in the tagging as there were on the first series of baby wildlife a year ago. 63c Woodchucks Dec 11/13 ? Dec 11/13? The rolls were wrapped around a thick inner core or cardboard. 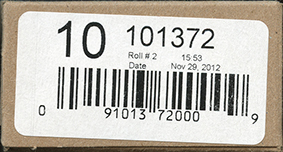 A clear, self-adhesive sticker was applied on the end of the roll to keep it rolled. This 'wrapper' had a UPC barcode which would be scanned at the post office checkout. 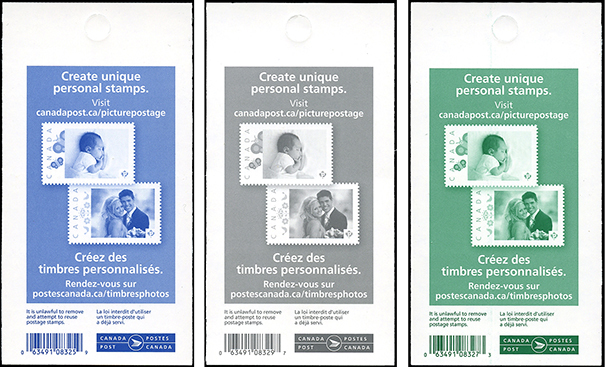 Each wrapper was colour-coded to match the corresponding stamp. 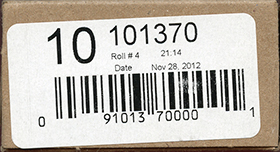 The left side of the non-Permanent(tm) wrappers include the total value of the roll; in the past these showed only the denomination of one stamp. Interestingly, the UPC numbers are not sequential by denomination. 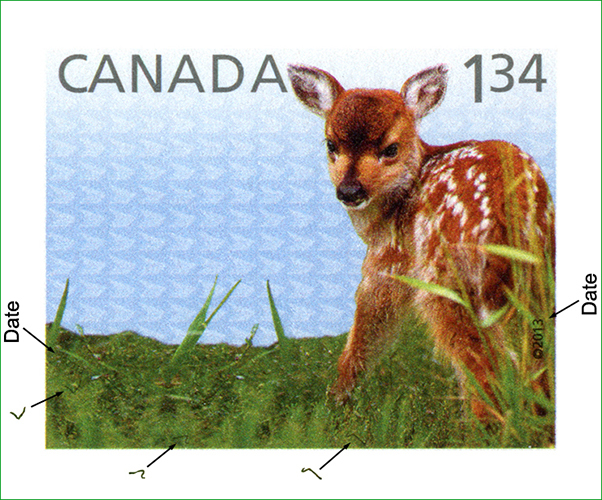 To date, one die cutting pattern has appeared on these stamps. Each of the 10 different columns across the 'sheet' have a slightly different position of the 3-nibs and die cutting. 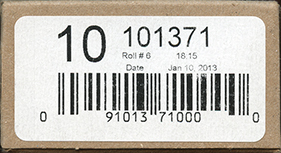 The Permanent coil was released in rolls of 5,000 stamps on January 14, 2013. The die cutting is a consistent 9.2 across the top and bottom of the stamp. Due to the consistent, and different die cut gauge, these stamps are different compared to those from rolls of 100. They may prove to be difficult to find on commercial mailings used in period. 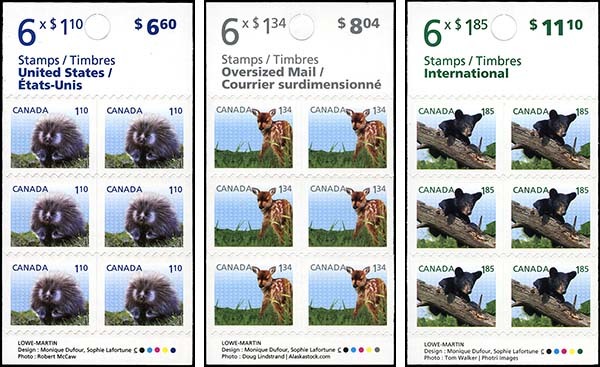 The stamps are rolled in a horizontal format (compared to vertical for the same design in rolls of 100 issued to post offices). There is a gap between the stamps and extra backing paper above and below the stamps. Illustrated below is a strip of 10, as received from the philatelic sales branch. 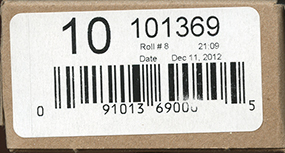 These stamps could only be ordered in strips of 4 or 10; full rolls are only available to business clients. There are no additional markings on the roll - either front or back. 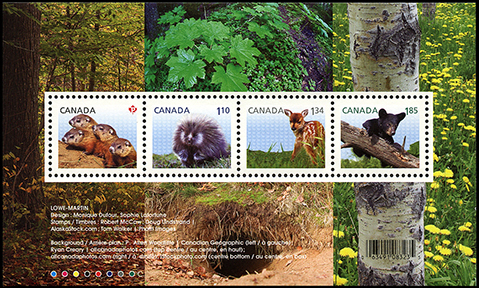 The $1.10, $1.34 and $1.85 designs were issued in booklet "panels" of 6 stamps. The original printings of these booklets advertised mailing letters, each denomination in a different colour.